What are the approaches for Vaccine Development? Scientists take many approaches to design vaccines against a pathogenic microorganism. These choices are dictated by the nature of pathogen and the infection as well as practical considerations about the use of the vaccine. Some of the options include live attenuated vaccines, inactivated vaccines, DNA vaccines and recombinant subunit vaccines. See schematic below for an overview of the various approaches used to make a vaccine. This technical note discusses the basics of research and production of recombinant vaccines. 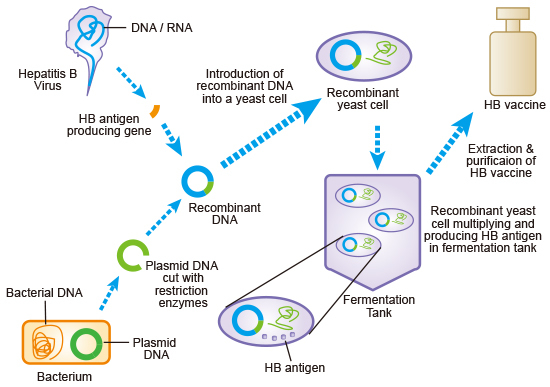 Vaccine generated using recombinant DNA technology is called recombinant vaccine. Recombinant vaccines can be created in a number of different methods, as demonstrated in Figure 1, but how are they produced? These types of vaccines are manufactured with the assistance of expression systems, such as bacteria, insect, yeast, plant, mammalian, and cell-free. There are several pros and cons to each of these types of expression systems, but for this particularly blog, we will focus on bacterial expression. Bacterial, usually E.coli, expression is the “work-horse” and most popular organism used for recombinant protein expression. Due to in part with its ease of bioprocessing and scale-up, strain engineering, lower cost, and shorter production times. A combination of simple genetics, ease of culturing and scalability, fast expression, and high yields makes E.coli an attractive choice. There are some disadvantages to keep in mind when using E.coli for expression. There is a lack of an efficient post translational machinery, there is also codon usage bias, and difficulty in producing high molecular weight proteins. However, one of the biggest issues with E.coli expression, which is nearly as bad as Low expression or no expression, is insoluble expression. This is the phenomenon that occurs when overexpression results in the formation of insoluble aggregates called inclusion bodies. When that happens you could try a cumbersome process called in vitro protein refolding and still get the necessary outcome or we could attempt optimization at the process or molecular levels. At the process level you can adopt methods that do not require target engineering, for example we could play around with the expression conditions like trying out different strains or adjusting the growth and induction conditions, changing media, buffers, and chaperone co-expression and in some cases even improving the cell lysis conditions2,3. While there are various types of vaccines made possible by recombinant DNA technology, recombinant vaccines can be classified into two major categories. These vaccines usually consist of synthetic DNA containing the gene that encodes the disease-agent protein. 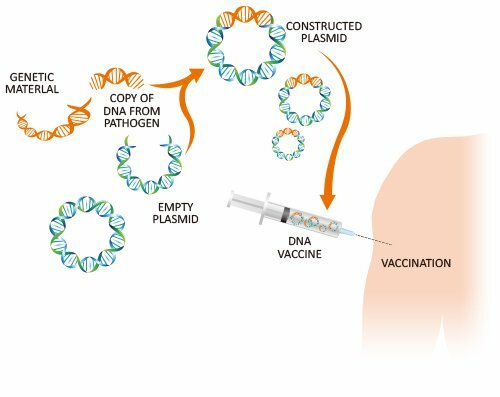 Usually, the plasmid DNA used as vaccine is propagated in bacteria such as E. coli and they are isolated and purified for injection. This "naked" DNA is usually injected intramuscularly or intradermally. The principle behind a DNA vaccine is that the antigen can be expressed directly by host cells in a way that simulates viral infection and invokes an immune response from the host. 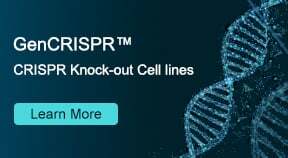 This is similar to GenScript's DNA Immunization Technology which is a powerful tool that aids in custom antibody production against membrane proteins, other problematic antigens, as well as for early DNA vaccine development studies. DNA immunization technique allows antigen production to occur in vivo, bypassing the need to produce and purify protein antigen in vitro. Click here to learn more about how GenScript's DNA immunization service can help you succeed in your next DNA vaccine development project. Schematic below illustrates concept of DNA vaccine. Figure 2: Principle of DNA vaccine. What are Recombinant (protein subunit) Vaccines? These are subunit vaccines containing only a fraction of the pathogenic organism. Often time these are synthetic peptides that represent the protein component that induces an immune response. But they can also consist of protein subunits (antigens) expressed in a heterologous expression system (E. coli, yeast, insect etc.) using recombinant protein expression technologies. Most of the vaccines under investigation today are based on such purified recombinant proteins or subunits of antigens. Prokaryotic expression systems for vaccine antigen production include bacteria such as E. coli and eukaryotic systems include mammalian, yeast or insect cells. Several factors are taken into consideration before selecting the right system for vaccine antigen expression. Among other things, expression levels, selection marker and the presence or absence of post-translational modification are essential factors that interfere in the efficacy of production of recombinant antigens as vaccines. 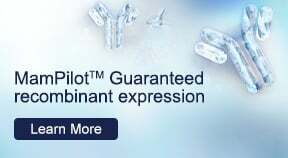 Bacterial expression systems are widely used due to the ease of handling and their capacity for high level expression. 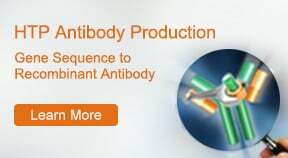 Selecting the proper antigen is one of the most critical steps in any custom antibody project. In most cases, scientists either use protein antigens or peptide antigens for this purpose. Their unique ability to elicit antibodies that recognize the native confirmation of the target protein makes them a superior choice over other antigen alternatives. Given their structural complexity and size, proteins are inherently strong immunogens. Added to that, antibodies generated from protein antigens recognize multiple conformational epitopes within the target protein. This characteristic enhances antibody selectivity and specificity compared to anti-peptide antibodies. Recombinant E. coli protein expression is frequently used for the generation of protein antigens for antibody production. Antibody fragments are engineered antibodies that only contain a portion of an immunoglobulin. One example of a group of antibody fragments is the antigen- binding (Fab) fragment, which is the region of the antibody that binds to antigens. This type of antibody fragment is composed of one constant and one variable domain of each of the heave and light chains. A second type of antibody fragment group is the fragment crystallizable region (Fc region), which is considered the tail region of the antibody that interacts with cell surface receptors and proteins of the complement system4. 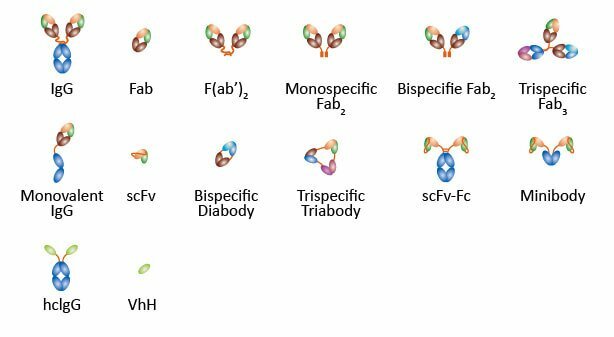 Though these are the two major groups of antibody fragments, there are several different varieties that were not mentioned such as scFvs, VHH/VH that are also used for different research applications. scFvs and VHH/VH also retain full antigen-binding capacity and are used for research, diagnostic and therapeutic applications. Fragments are particularly useful in applications where epitope binding is sufficient for the desired effect including therapeutic applications such as creating a vaccine through virus neutralization or receptor blocking. Due to the fact E.coli is a simple system and easy to scale up using fermentation, it becomes the best system to use for expression of antibody fragments, especially for vaccine research5,6. Figure 3: Schematic depicting different types of antibody formats generated from the traditional antibody structure of IgG. What is an example of a recombinant vaccine? The current vaccine for Hepatitis B Virus is produced by expressing the HBV surface antigen (HBsAg) using yeast expression system. Yeast secretes the antigen into culture supernatant facilitating purification. Yeast post translational machinery is suitable for this purpose as it renders the Antigen with the necessary glycosylation patterns. 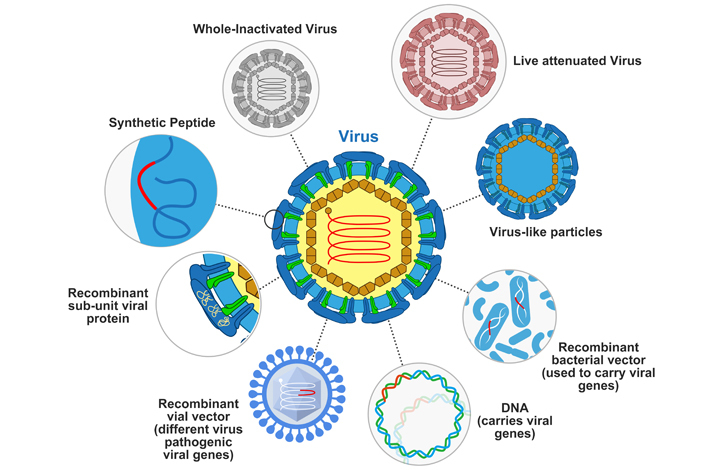 Upon recombinant expression, the HBsAg assembles into virus-like particles (VLPs) which are extremely immunogenic, making it a very effective vaccine. Another example of a recombinant protein vaccine is the vaccine against Human Papilloma Virus (HPV). There are currently two vaccines against HPV infection, both of which have been developed based on VLPs assembled from recombinant HPV coat proteins. These vaccines utilize the L1 recombinant capsid protein of the virus subtype produced either in insect or yeast-expression system. At GenScript, E. coli expression is routinely used for the production of high quality recombinant protein used in vaccine research applications. To see an overview of recombinant protein expression systems, click here. Riedel, S. Edward Jenner and the history of smallpox and vaccination. Proc. (Bayl. Univ. Med. Cent). 18, 21–5 (2005). Baneyx, F. Recombinant protein expression in Escherichia coli. Curr. Opin. Biotechnol. 10, 411–21 (1999). Terpe, K. Overview of bacterial expression systems for heterologous protein production: from molecular and biochemical fundamentals to commercial systems. Appl. Microbiol. Biotechnol. 72, 211–222 (2006). Antibody fragments. Available at: http://absoluteantibody.com/antibody-resources/antibody-engineering/antibody-fragments/. (Accessed: 24th July 2018). Spadiut, O., Capone, S., Krainer, F., Glieder, A. & Herwig, C. Microbials for the production of monoclonal antibodies and antibody fragments. Trends Biotechnol. 32, 54–60 (2014). de Marco, A. Recombinant antibody production evolves into multiple options aimed at yielding reagents suitable for application-specific needs. Microb. Cell Fact. 14, 125 (2015).